My name is Duncan and I am interested in fonts. Against my better judgement, sometimes I blurt out this fact, and people run a mile. But is it becoming acceptable? 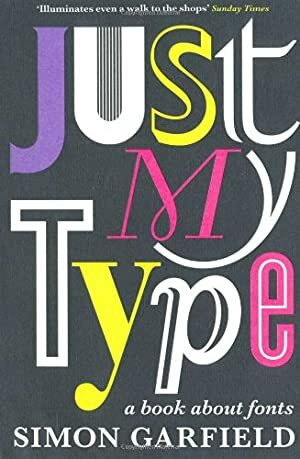 Simon Garfield’s book, Just My Type, would make it seem like a perfectly normal interest. Though there is a nod and a wink towards the quirkiness of the subject, the book is a serious and well-researched work, crafted with passion and wit. This is one of the most entertaining books I have ever read. It is breezily written and easily read. I don’t think I have ever made my way through a book so quickly. It covers everything from the ubiquity of Helvetica to the illegibility of Grassy. You go on a journey using Johnson’s Underground and road signs in Transport. Political lessons are learned through the font choices of Nazi Germany (gothic) and Barack Obama (Gotham). The amazing thing is that each of the fonts covered in this book could almost have a book to themselves — or at least an essay. At most, a font is given a chapter to itself. Yet you go away feeling that you have been given all the salient information in an astonishingly concise fashion. Nothing necessary is left out of this book. Nothing unnecessary has been put in. Even for someone like me, who was already interested in fonts, Just My Type has taught me to at fonts in a newly enlightened way. For instance, my appreciation for the design of an ampersand has been greatly increased. The vivid description of Garamond’s ampersand (“resembling the darting tongue of a lizard catching flies”) is one of the book’s highlights. It has clearly affected me. Today I suddenly noticed that the ampersand in Segoe UI (the font Microsoft use for their user interfaces) resembles a cat licking its paw. Now I can’t shake that image out of my head. Clearly, if you are interested in fonts, you really must buy this book. If you are not interested in fonts, you really must buy this book. You will be surprised at how fascinating it is. Simon Garfield is the perfect writer for it. His bright tone is far away from any nerdy connotations that the subject might evoke. This is probably the perfect book about fonts. It might even be the perfect book.